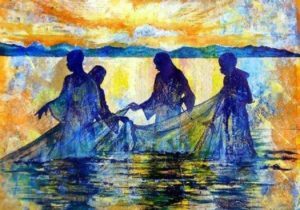 The fishing imagery in the Gospel story is a bit remote for those of us who get our fish from the market and sushi from bars. But despite this, the message is clear; in the course of his ordinary working life, just getting on with his job, running his fishing business – Peter is confronted by God in Jesus, and the experience makes him feel small and inadequate. But this doesn’t hold him back. When Jesus tells him that he has a job for him. Peter leaves everything and follows. His life is changed forever. Jesus’ encounter with Simon Peter gives us some hints about what evangelism should really be. Jesus enters Peter’s world, shares his boat and his life and as a consequence Peter is drawn into Jesus’ life and work. Despite his fears, he finds that God equips him for whatever God calls him to do. The living Christ was with him, and is with us as we push out into the deep and often scary water of sharing the Good News with the people we meet. And he said, yes you. And what will the neighbours think? And he said baloney. And cut me up in little pieces. I can’t take it all by myself. Although he felt inadequate, when the eternal God asked Isaiah ‘Whom shall I send and who will go for us?’ his only possible answer was ‘Here I am, send me’.